Home / Who We Are / What Is A Project? A project is where FoodCycle volunteers collect surplus food and cook it Ready, Steady, Cook-style into delicious meals which they serve to guests from the local community. At every meal, volunteers and guests sit down together to eat the meal together. Conversation flows, barriers are broken down and friendships are formed. We work within lots of different communities and meet all kinds of people at our projects. 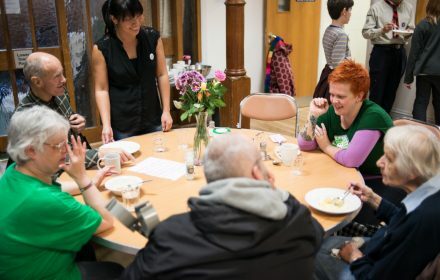 Many of our guests include older people, people dealing with mental health issues, those affected by homelessness, low-income families, asylum seekers and refugees, and people who are long-term unemployed. When my benefits weren’t sorted, we were short of food, and used to go three or four without any food. It’s made me come out of my shell more. I used to be right quiet, I wouldn’t talk to anybody. I would just sit, and think "are they talking about me? ", but I’m more happy coming here. At least I can come out and have some good fun, and some fresh air. You get to know different people every time, which is good. I live in this area and I come here for the pensioner’s meal on a Thursday and some of the ladies who come to FoodCycle said, “why don’t you come along on a Wednesday evening?". I said I live alone and they said it would be good company for me and that’s the reason I come, just to share in the fellowship of the people who are gathered here for the meal. I’ve got four children: two boys, two girls and I bring them all here. It’s really hard trying to get vegetables in kids, especially in the boys, but they eat everything here. Even if they don’t like it, they try it, even just to give it a go and that’s why we keep coming. Every week, it keeps the kids happy. On a Wednesday: they say “We’ve got FoodCycle tomorrow! !” they get so excited about it now.